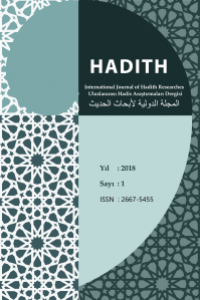 HADITH is a peer-reviewed Journal published twice a year as July and December (31st July and 31st December). In HADITH, only works related to the field of hadith (and sunna) are included. In addition to original and scientific articles, it accepts translations of articles and papers, edition critics, thesis, book and symposion reviews, reviews, interviews, memoirs, hadith news, etc. Papers may not exceed 9.000 words. Submitted articles are scanned by the plagiarism detection program in order to check that they have not been previously published and to find out they do not contain any plagiarism. Then, they are evaluated by double-blind review fulfilled by at least two referees who have already studied on the subject. Articles accepted by the referees should contain a 150 words abstract with at least 750-800 words extended abstract and must be in two of Turkish, English or Arabic languages other than the article language. Authors have to transfer the copyright to HADITH. According to the Copyright Act, all the publication rights of accepted articles for publication belong to the publisher. This transfer becomes binding upon the acceptance of the publication. All the responsibilities of the contents of the articles belong to the authors. Authors are not paid for publishing their papers. Authors are obliged to fill out “The Copyright Transfer Form” and to send it to the editor via e-mail. There are no evaluation fees from the authors in this journal. HADITH requires the authors to use the ISNAD Citation Style (https://www.isnadsistemi.org/).